Then why not just share it? I've asked two times now for you to share your profile, but for some reason, you aren't (or won't). Because of two reasons really. 1) A little paranoia after being wrongfully banned. 2) I just didn't want to. But since you've gone all passive aggresive on me.. here you go. BORING AND BASIC SETUP FOR FARMING. (pastebin wouldn't let me post something so 'large'. I had to use a pastebin alternate). Now i'm going to go over what I said originally once more, just to make sure you have followed along. A Single 980 ti running my 30 'slaves'. A Single 980 ti running my Main. We had to rename the cards in order for World of Warcraft client to split the load properly. 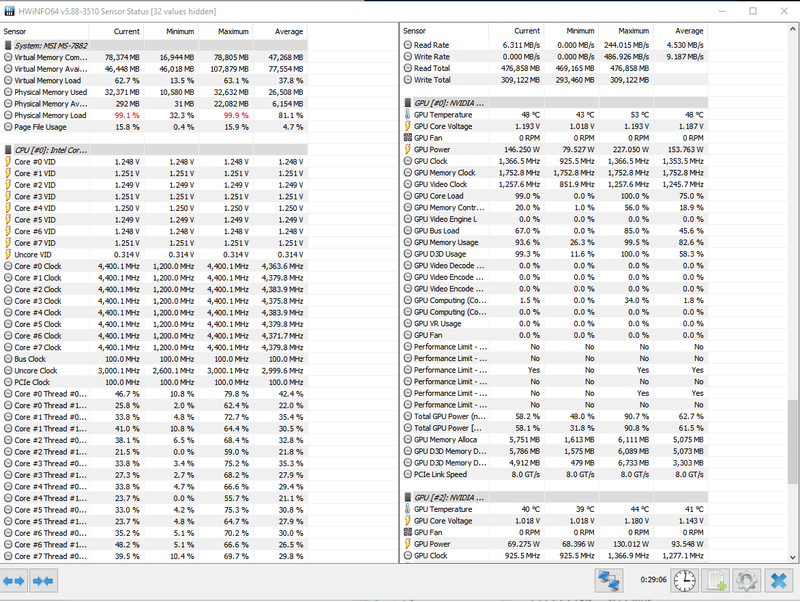 So 4 cores, 8 HT runs the 30 accounts. Nvidia GPU #2 in the first screenshot. The remaining 4 cores, 8 HT runs my main/windows/twitch etcetc with no throttling or bottleneck. Nvidia GPU #0. Your second GPU is at 0 because you aren't rendering your main right? the 5 clients are on settings 1 (etc) to mimick my 30 slave setup? 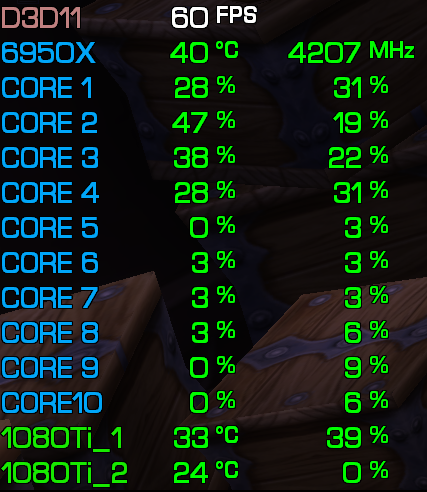 I was originally posting about the CPU differences and what they can achieve in WoW based on some testing I did with different hardware, I was bored at work one day. I tried running more than 12x actively and it s... the bed. on that machine. So I had to buy another machine. And I ran at like a 3 graphic level. 45 max frame rate, 12 on slaves in background. Even with my i9-7980XE 18/36 core,, overclocked to ~4.2ghz, 64 gigs ram, with raid 0 NVMe drives. 1080ti's etc... it's really not possible to run more than 26 instances with Isboxer USING the built in FTL - you run out of the 6 key combos that make it possible - an issue I ran into. Maybe you could open more instances and use some other method to do FTL that would work? No clue. With 10 characters, using graphics level 3 on my i9-7980xe (18/36 core), with a 1080ti using only a single 3440x1440 Ultrawide, I get about 45 FPS in town. Note the ~52 fps doing nothing - with no one around, and that's a 1080 ti card - at 3 graphic level. 60 foreground/15 background. Although the main window is big. I will say it's still silky smooth, just not capped FPS wise - with 10 instances of wow at graphic level 3. I want to see evveerryyyttthhiiinnngggg. Hey, I've been following along and appreciate the extra info. You're right it started to get a little pass/agg, but that is mainly because what you are saying is rather outside of the realms of others experiences with their hardware, so much so that they seem a little unbelievable, and if it is really possible to get away with more limited hardware, then hey, we've been steering others the wrong way with some of their questions about what they need, and it would be really good to have some concrete data about what you can do with what hardware, and with what limits. Please don't take the prior incredulousness the wrong way, it was more the jaw hitting the floor type moments. p.s. as we worked out the other day, ISBoxer's FTL can have upto 63 combos. The WoW macros can work with left and right modifiers of the same key, so leftshift + rightshift actually works, which opens up a bunch of extra settings that the default wizard currently excludes by default; yes it limits to 26 currently, but you can always fix up the remaining ones. I just didn't want to. But since you've gone all passive aggresive on me.. here you go. It's as bob stated—you were saying things outside of the realm of anything we had heard, or personally experienced before, and I just didn't believe it. When people are asking for help in building a computer for multiboxing, it's only fair that I provide accurate information when I give them an answer, especially since I tend to dabble in this area of hardware. Now, if someone is saying that they can multibox 30 game clients on a 4C/8T CPU with a 980 Ti, well... that sets off an alarm, not only because I regularly speak to people who struggle to run five game clients at a lower resolution on hardware that's just a few years old, it's wildly different than anything I've personally experienced throughout the several hardware configurations I've used over the years. However, I had a sneaking suspicion of what was actually happening, for which your profile would reveal, and as I suspected, it contains the answer. Looking at these numbers, you can see that the total pixel count being driven by your GPU, when multiboxing 30 game clients, is less than the actual total pixels of the 21:9 display itself. The same applies for your 16:9 setup, where you're pushing less pixels than the actual 25x14 display. So, naturally, this would be a very light load for the system to handle. In addition, the game clients in your 21:9 setup are running at a resolution of 573x240, which is nowhere near the 3840x1630 that I'm running mine at. As you can see above, both Kicksome and myself are driving a very similar pixel count, with the same GPU, and our hardware usage is probably also similar (in-game settings can differ). This is why your numbers are wildly different than others—you aren't running 30 game clients at 3440x1440, you're running 30 game clients at 573x240, and they just happen to be on a 3440x1440 display. I genuinely thought it was still rendering everything in the same way kicksome and yours was when used like this . Been quite sick which is why I hadn't responded until now. Yeah. Tested it. So I learned something new. When you used Stacked, Tiled, no swapping it will just render at whatever the size of the client is at in order to fit on the screen. When using <any layout> with swapping it will maintain the resolution even if the size of the client is teeny tiny... sigh (however if you load them up with a swapping layout then change to a non-swapping layout without resetting the client, the resolution stays the same. The resolution is only lowered if you open the clients with a non-swapping layout first). It is ofc possible to achieve a lot of things on a crappy pc, but it will look like garbage. To me anyway. Thats why i personally dont accept anything less than 1080p, 2 cpu cores and minimum 30 fps background/60 fps foreground, for each game. And max 9 games per monitor, so its atleast possible to see clearly whats going on. Well, in your defense, fast-swapping is a modestly recent addition. In The Beginning, nobody had fast-swapping-enabled boxing apps, so that was just the way everyone did it, and why it "looked" like people were able to 5-box on really old i7 CPUs and lower-end GPUs. And yes, that renderscale options is *AMAAAAAZING*. Best part is it leaves your UI at normal size so you can read/see UI things properly via dxNothing repeater windows. A few things I've noticed going from the intel line to a 2950x and 2990wx. This is also based on 'stand-still' farming. Some quirks between the two. So with the intel (5960x) chip you could semi-abuse the pagefile to make up for lack of Memory. For example I could run 40 accounts with no memory related issues by having a dedicated SSD host a large pagefile (160gb+) while only having 32GB of RAM installed. CPU worked well with windows to handle it all. I tried to do the same with the 2950x and 2990wx and the performance was terrible. The whole system would 'micro-freeze' and stutter. CPU was pegged at 100% when using a larger pagefile. With the intel cpu I could farm at 15-20fps on all the slaves quite happily. The AMD line wouldn't give me anything over 3fps when the pagefile was in use (heavily). I bumped it up to 64gb of Memory and a smaller pagefile.. same issue. I went to 128GB and everything THEN ran amazingly. Intel would run on standard Windows power profiles. AMD requires you to install a 'dedicated amd' power plan which gives the cpu controllers access to do its thing. Works better as a result and you have a few more things to play with. So I happily spent 6 hours overclocking (each) the 2950x and 2990wx in the Bios. Quite finicky and you need to be precise for the cpu to shine. For example you can get it to post at 4.5ghz yet it's performance can be well under stock if you don't dial in the power right. My best cinebench (only 2950x) was 3850; which took 6 hours to hit. I decided to set everything back to stock and use the windows program 'Ryzen Master'. Oh my god what a treat. You enter how many watts you are happy to have over the cpu, how many amps it can draw... SO NICE. I put down 250w for cpu, leave the amperage (spelling?) default.. it uses the CPU temps.. press one button and bam, done. So in 6 hours my best cinebench was 3850, 2 minutes with the Ryzen Master tool and I hit 3830. Its beautiful. Isboxer doesn't register all the cores in the CPU wizard. Temperatures? My 5960x @ 4.8ghz would hit 70c under constant load with my custom WC loop. My OC 2950x hits 32c under load with the same WC setup. The cpus are so large and easy to cool. When I find out how to safely load it up with more power i'm gonna hammer this thing and see what I can get out of it. Very interesting data, there. Thanks for sharing. Have you tried PBO yet on the AMD system? From the reviews I've read if you have solid cooling PBO manages overlocking more efficiently than trying to manually configure it. I've also read that AMD"s "infinity fabric" CPU die interconnect is heavily dependent on RAM speed and timings so paying extra for a 3200+ CL15 kit might be worthwhile. I wonder if ISBoxer's wizard not detecting cores is an AMD issue or will occur on any system above a certain number of cores? I've read some people use the 7900X with no mention of this issue. I've decided to wait until the end of November for the rest of the Intel refresh. The 9920X or 9940X seem like they'll be solid performers both for multitasking and single threaded without all of the quirks of AMD processors that I was concerned about. The 7920X can hit 4.5GHz comfortably so I imagine the 9920X should be capable of a few hundred MHz more with its improved heat management. Hopefully I'll actually be able to buy a GPU by that stage, too. They've released but you can't find an 2080Ti in stock anywhere near where I live.